In general sports watches are known for their cheap and tough designs. When a high quality one comes along it can be easy to overlook them. This TAG Heuer Formula I Grande Date, 44MM demands your attention as it simply screams with quality and elegance. This Tag promises a superior quality watch, and I am pleased to say that this product does not disappoint. With its elegant design, high quality materials, and quality features it is every bit deserving of the Formula I name. This watch comes with a white or black dial, round time markers, and frame hands. Either the white or the black dial looks great, and gives a classic black and white look to the watch. The six o’clock position of this watch has a second counter with an amazing spiral background. The numerals and markers are large and easy to read. The watch has hour numerals on the dial, and minutes on the case so you can see the exact time at a glance. And, the dial is luminescent, so you can easily read it in the dark. While the band on this watch is made of rubber, it is thick, comfortable, and durable. This Formula I comes with scratch resistant sapphire glass, a titanium coated crown, and is water resistant up to 200 meters. With this watch you can be certain that it is made to last, and will stand up to the elements. This watch costs anywhere between 700 and 900 dollars. As far as luxury watches go this is a great price. Formula I prices are typically in the $800-$900 range, so with this model you’ll spend a little less. This watch is more causal than many TAGs, but it will definitely look great with a suit. For people looking for something a little more formal, but with a sporty touch TAG’s Aquaracer or Carrera could be a great alternative. Although, expect to pay more with those models. With the Formula I Grande Date, 44MM TAG has attempted to tread a fine line between style and convenience. 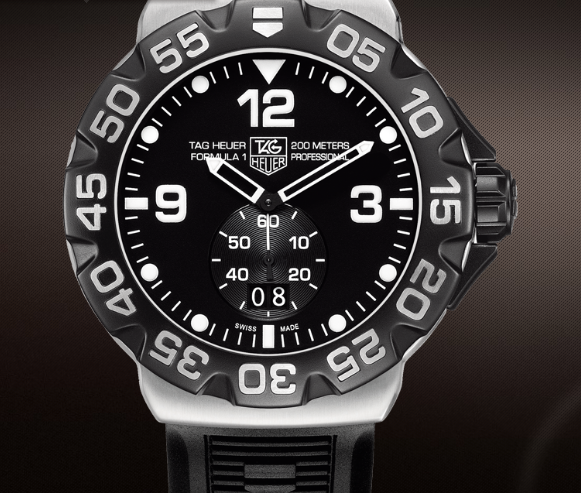 Happily, TAG has hit that mark brilliantly making a great watch at a great price. If you are looking for a casual sporty watch of excellent quality this is a great buy. On top of quality and a great look it is built for the active person in mind. Wherever you go you can be sure this watch will be durable, and look amazing.